Learning How to Navigate " EYES ON THE SOLAR SYSTEM"
Jump in and start exploring the Solar System on your own. The solar system's smallest planet flits back and forth from morning sky to evening sky several times a year. It never strays far from the Sun in our sky, so it's tough to find in the glare. From the northern hemisphere, it is visible in the morning sky this year in January, April/May, August, and December. The late-year appearance is the best because the planet will stand highest above the horizon. In the evening, Mercury is best seen in February/March, June/July and October. The early March appearance is best. Venus, the dazzling morning or evening star, outshines all the other stars and planets in the night sky. It begins the year in the evening sky, in good view in the west as darkness begins to fall. It stages a spectacular encounter with Jupiter in mid-March. It will disappear from view in May as it passes between Earth and the Sun. In fact, Venus will pass across the face of the Sun on June 6, staging its last transit for more than a century. The planet will return to view as a “morning star” a few days after the transit, and will remain there for the rest of the year. Mars puts on its best showing early in the year, when it shines like a brilliant orange star. The planet is at opposition in early March, when it passes closest to Earth and shines brightest. As the year progresses, it will fade as it moves farther from Earth. Mars will huddle close to Regulus, the brightest star of Leo, in late March and early April, then stage beautiful close encounters with Spica, the brightest star of Virgo, in mid-August, and the planet Saturn a few days later. The largest planet in our solar system, and the second-brightest object in the night sky after the Moon, begins the year quite high in the south at nightfall. It will stage a beautiful encounter with Venus, the “evening star,” in March. Jupiter will disappear in the Sun's glare in late April, then return to view in the dawn sky in late May. The planet's best appearance comes in December, when it lines up opposite the Sun in our sky. It will shine at its brightest for the year and remain visible all night. Saturn looks like a bright golden star. It spends all but the last part of December in the constellation Virgo, the virgin. 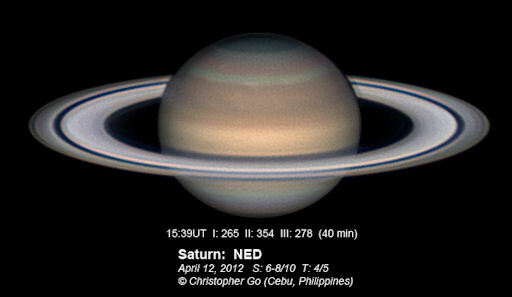 Saturn is at its best in April, when it is closest to Earth. It disappears behind the Sun in early October, then returns to view in the morning sky in November. 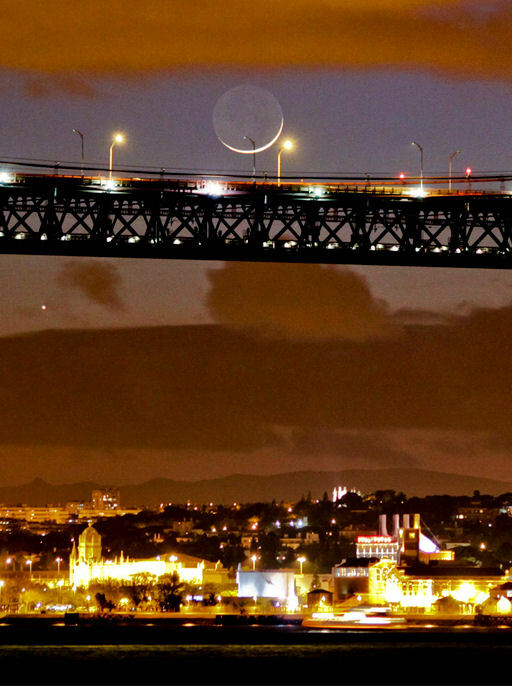 Miguel Claro photographed the crescent moon from Almada, Portugal. "Look just below the bridge," he points out. "You can also see Jupiter." The slender crescent will be beaming through the twilight for the next few evenings. On Tuesday, April 24th, it will glide by Venus for a spectacular sunset conjunction. Don't miss it! LOW SUNSET CONJUNCTION: If you have a clear view of the western horizon, look there tonight, Sunday April 22nd, just after the sun goes down. Jupiter is shining close to an exquisitely-thin crescent Moon. It's a nice photo-op. images: #1 , #2 , #3 , #4 . Panasonic Team to Lug Solar-charged Batteries up Mt. Fuji, Live-stream Eclipse - Panasonic will broadcast live a solar eclipse next month over Japan from the top of Mount Fuji, using batteries that are charged at the base using solar power and then carried up to the peak. SATURN'S RINGS AT THEIR BEST: On Sunday, April 15th, Saturn is at opposition--directly opposite the sun in the skies of Earth. The ringed planet rises at sunset and soars high in the sky at midnight , up all night long. This is the time when Saturn's rings are at their best. From the point of view of Earth, shadows in the ring plane almost completely disappear (just as your own shadow tries to hide beneath your feet at noon) and sunlight is directly backscattered by icy ring particles toward our planet. "Saturn is close to opposition and the rings are brightening. This is the Seeliger Effect ," says Go. "Also a Northern Electrostatic Disturbance, which was detected by Cassini a few days ago, can be seen as a white patch north of the green belt." International Dark Sky Week 14 - 20 April, 2012 - Celebrate the stars! Created in 2003 by high-school student Jennifer Barlow, IDSW has grown to become a worldwide event and a key component of Global Astronomy Month . The goals of IDSW are to appreciate the beauty of the night sky and to raise awareness of how poor-quality lighting creates light pollution. Global Astronomy Month , your gateway to a month-long celebration of the cosmos. GLOBE at Night , a citizen-science program to measure light pollution from your own back yard 11-20 April, 2012. IDA Practical Guides and brochures that explain light pollution's negative effects. "Thanks to its orbit, Venus' appearance in the sky repeats itself almost exactly every 8 years," explains Keen. "Forty years ago, on April 2, 1972, Venus passed by the Pleiades only half a degree from its position two days ago. It's fun to compare this photo I took back in 1972 with this week's wonderful images." 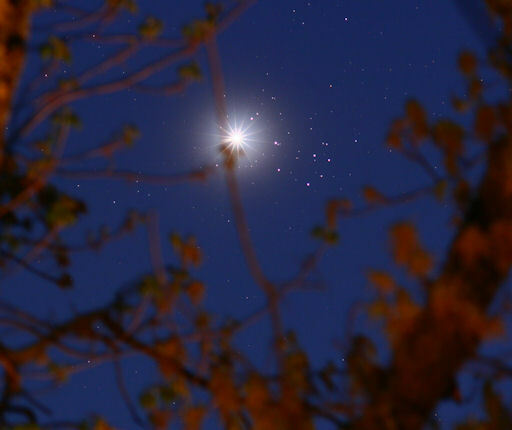 "The view of Venus, an eighth sister among the Pleiades framed by branches bearing freshly opened oak leaves, was nothing short of mind-blowing!!" he says. Tonight, Venus exits the cluster, so this is your last chance to see a meeting that occurs only once every 8 years. Don't miss it . VENUS INVADES THE PLEIADES: This week, Venus and the Pleiades star cluster will meet in the evening sky for a rare and beautiful conjunction. Get the full story from Science@NASA. Images: #1 , #2 , #3 , #4 , #5 . CATCH THE CONJUNCTION! When the sun sets tonight, go outside and look west. 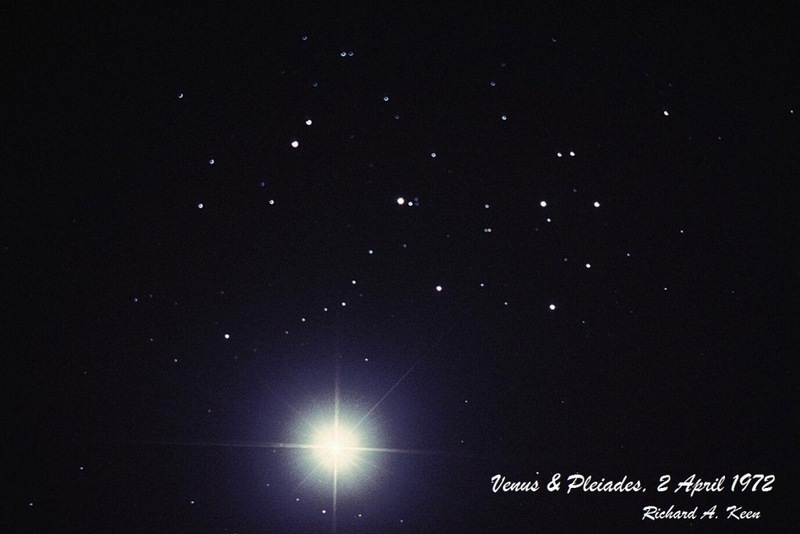 The planet Venus is in conjunction with the Pleiades star cluster. This only happened once every eight years, so don't miss it ! "Venus and the Pleiades were like diamonds in the sky," says Mazurkiewicz. "It was a beautiful sight." Although the conjunction may be seen with the unaided eye, it is even more beautiful through a small telescope, binoculars, or the lens of a camera. Regard this magnificent close-up from David A. Harvey of Tucson, Arizona. His camera settings are available for readers who wish to try a similar composition. Connecting the dots, the brightest stars of the Pleiades resemble a tiny dipper. Tonight, April 3rd, Venus will brush the bottom of the dipper's bowl--a very close encounter indeed. Enjoy the show! Did you know that President Abraham Lincoln spotted Venus in the daytime in 1865? "They are easy to see with the naked eye," says Croisier, "and they look great through a telescope, too." The triangle will appear again on Monday evening, March 26th, although the vertices will be shifted as the Moon glides from Jupiter to Venus. Observing tip: Look before the sky fades completely black. Bright planets are extra-beautiful when they are framed by twilight blue. Sky maps: March 25 , March 26 . The planets dominate this month, particularly during the evening. As night falls, Venus and Jupiter shine forth in the west, the second- and third-brightest objects in the night sky after the Moon. Venus is below Jupiter as March begins, but climbs past it mid-month. While they dominate the west, Mars takes charge in the east. It rises around sunset and remains in the sky all night. It is brightest for the year, too, forming a brilliant orange beacon. March 23, 2012 The current North Star, Polaris, forms the tip of the handle of the Little Dipper. Over thousands of years, though, Earth's axis wobbles, so it points at different stars. Five millennia ago, it pointed at Thuban in Draco, so Thuban was the North Star. March 25, 2012 Jupiter, the giant of the solar system is just to the lower left of the Moon this evening, and looks like a brilliant star. The even brighter planet Venus stands above them. March 26, 2012 The bright golden planet Saturn rises in mid evening, close to the left of Spica, the brightest star of the constellation Virgo. The pair arcs high across the south during the night. March 27, 2012 Spring arrived in the northern hemisphere a week ago, but the most prominent stars of winter remain in good view. They form a big loop known as the Winter Circle, which is in the southwestern quadrant of the sky in mid evening. March 28, 2012 The constellation Crater, the cup, is visible this month in the southeastern evening sky. Its stars are faint so you need dark skies to find it. To ancient European cultures, Crater represented the birthplace of storms. March 29, 2012 Canis Major, the big dog, is in the south-southwest in early evening. It features the night's brightest star, Sirius. The lesser dog is above it, featuring the eighth-brightest star, Procyon. Check last week's tips if you missed a day. SUNSET SKY SHOW, AGAIN: A month ago, Venus, Jupiter and the crescent Moon aligned beautifully for evening sky watchers around the world. It's about to happen again. On March 24th, 25th and 26th, the trio will appear side by side in the western sky at sunset. 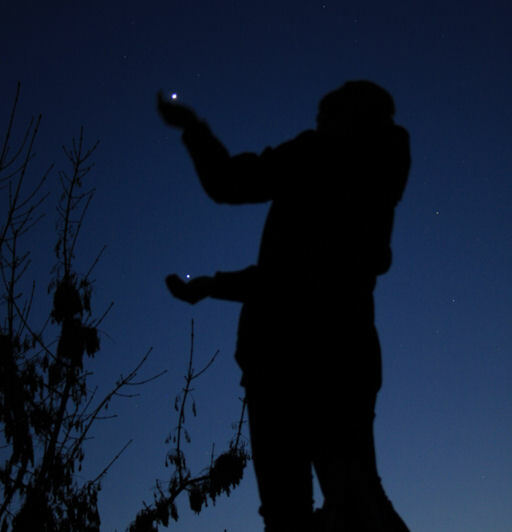 Observing tip: Catch them before the sky fades completely black. These bright objects are extra-beautiful when they are framed by twilight blue. Sky maps: March 24 , 25 , 26 . "Thanks to my girlfriend for helping me me create these planet action shots on March 22nd," says photographer Kiss Csongor of Derecske, Hungary. 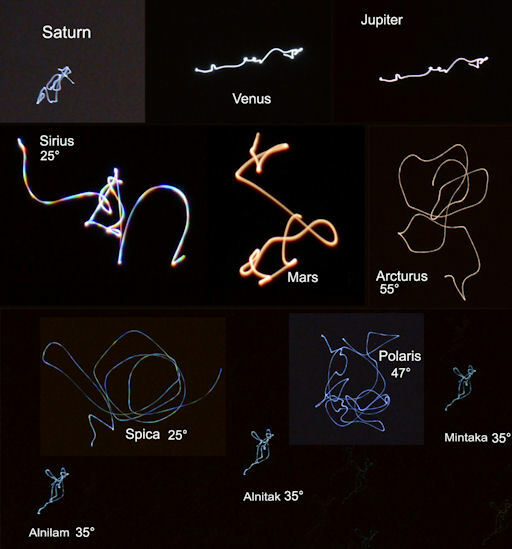 SCINTILLATION SQUIGGLES: Everyone knows that stars twinkle but planets do not. The reason has to do with angular size. Stars are distant pinpricks smaller than the thermal irregularities in Earth's atmosphere that refract their light. Each packet of air that passes in front of a star produces a well-defined change in color or brightness. Planets, on the other hand, are relatively nearby and wide; they span many atmospheric irregularities, which tends to smooth out the prismatic action. "If we take a photo of a star with a shaking camera, the result is a wavy line with many colors," she points out. "If we photograph a planet, however, there is no change; the color and width of the squiggle are nearly constant." The scintillation effect is greatest for stars near the horizon, which must shine through a greater distance of turbulent atmosphere. Angles noted in the image above are altitudes. The lowest-hanging stars display the strongest and most colorful twinkling. "Demonstrating this is a 'must-do' thing when you give a lecture or show on astronomical observations for novices," she concludes. Observing tips and more of Landy-Gyebnar's "scintillation squiggles" may be found here . "I was out last night walking the dogs," explains photographer Robert Hanelt of Santa Fe, New Mexico. "We just had to stop to admire the planets." Observing tip: Try to catch the duo before the sky fades completely black. Venus and Jupiter surrounded by twilight blue is a barking-good sight. "Venus and Jupiter are like two lanterns illuminating the darkness," says Nikodem. "It's a wonderful sight." The two planets are closest together on March 12th and March 13th . Try to catch them before the sky fades completely black. Venus and Jupiter surrounded by twilight blue is a wonderful sight indeed. Read More: Earthlings Dazzled by Venus-Jupiter Close Encounter On March 13, the two planets will drift to their closest point in the night sky, dazzling observers. The two bright planets seem to inspire photographic creativity. In Wiltshire, England, Richard Fleet measured their angular separation using a pair of cat's ears , while photographer Claus Vogel of Ottawa, Ontario, tried his hand at planet painting . "Venus and Jupiter glitter so clearly, they are like beautiful diamonds in the sky," says Nikodem. "It is an amazing and unique view." Last night in Cobourg, Ontario, photographer Malcolm Park caught the Moon and Mars converging. "[High clouds] created this lovely view from my back yard of an ice halo around the moon, with Mars inside punctuated by a high altitude contrail," says Park. CONVERGING PLANETS: Go outside at sunset and look west. Venus and Jupiter are converging there for a 3o conjunction on March 12th and 13th. Even now, more than a week away from closest approach, the bright duo are a wonder to behold. "They are like glowing lamps in the sky," says photographer M. Rasid Tugral, who created this astronomical self-portrait at his home in Ankara, Turkey. "I really enjoyed them tonight and also the reddish planet Mars." As the distance between Venus and Jupiter shrinks, something interesting happens. The converging pair can actually become physiologically, according to NASA. Do you find these planets hypnotic? 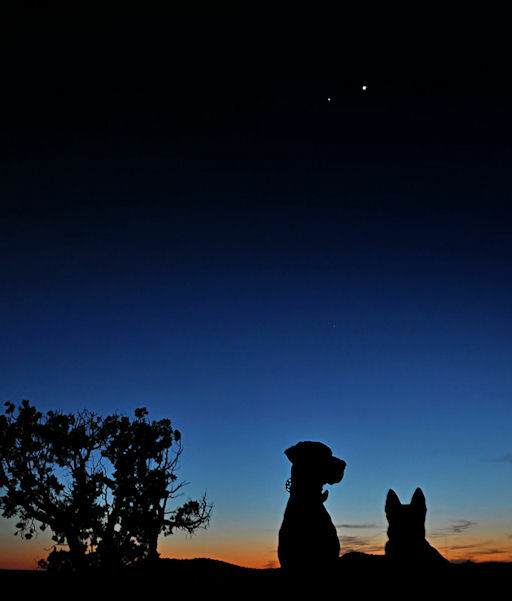 "Venus and Jupiter looked so beautiful," says McKenna, "They were simply stunning!!" The two bright planets are converging for a 3o close encounter on March 12-13 that NASA says could be physiologically mesmerizing. They are so bright, you can see them through city lights and even thin clouds. Done looking? Turn around. Another planet, almost as bright and more beautifully colored can be found rising in the east. 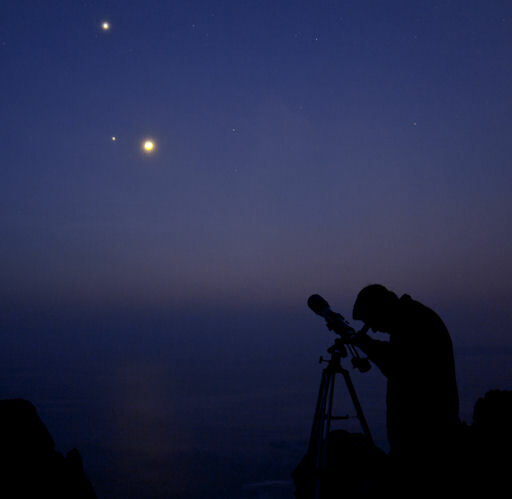 Mars is putting on a show of its own opposite Venus and Jupiter. The Red Planet is at its closest to Earth for all of 2012 on March 5th. It appears at sunset and soars overhead at midnight--an easy target for the naked eye and backyard telescopes alike. The Red Planet's nearest approach to us occurs as the Morning Star and the Largest Gas Giant appear together for a planetary spectacle in March 2012. The spring equinox brings about the Sun-Earth Day celebration and Comet Garrard joins the party. View Mars at opposition and planet highlights galore. On March 3 Mars reaches opposition, when it's closest to Earth in its 2-year orbit. This year Mars won't be very close, though. At best, it will be 63 million miles or 112 million kilometers from Earth. NASA's Mars Science Laboratory Curiosity rover will land in Gale Crater in August. On March 5 Mercury reaches its highest altitude in the sunset sky. You'll easily see its phase through a telescope. 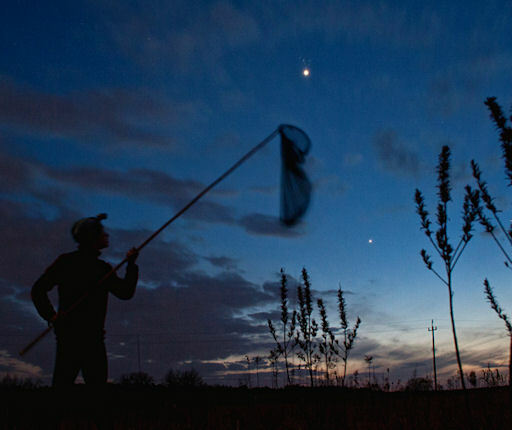 Have you been watching Jupiter and Venus, the two bright planets in the west? On March 12 and 13 they meet and pass one another. Venus is the brighter of the two, and through a telescope you can see its half-lit phase. Use the moon as a guide to Mars on March 7 late in the evening. And let the moon guide you to Saturn on the 10th and 11th. At sunset on the 25th look for the moon near Jupiter. On the 26th it's near Venus. If you didn't catch Comet Garradd last month, don't worry. It's still putting on a great display this month. Look between the Big and Little Dippers to see it through a telescope, even from your back yard in the city. March 20 is Sun-Earth Day. Many people around the world will celebrate it on or near the spring Equinox: March 19 or 20 with safe solar viewing parties, the only way you should ever look directly at the sun. And there should be more safe solar viewing parties for the June 5 transit of Venus. Lucky observers will see the planet Venus as it crosses the disc of the sun. A great way to prepare yourself for this is to find a local astronomy club or look for sky-watching events at your local museum. You can check out amazing solar images, including sunspots, flares and storms on the sun at NASA's Solar Dynamics Observatory website. And you can learn about all of NASA's missions to the solar system and beyond at www.NASA.gov . Mercury at its best in the evening sky - The innermost planet puts on its best evening show of 2012 during the first week of March. "The combination of planets with pale moon light, deep twilight colors, and the motion blur of clouds during a long exposure was enthralling," says photographer Chris Allington. As the three-way meeting of Jupiter, Venus and the Moon breaks up, attention turns to the other side of the sky where Mars is approaching Earth for a close encounter on March 3-5. "Turn your back on the dazzling duo of Jupiter and Venus and you can see the third bright planet of the season rising in the east -- Mars!" says astronomy professor Jimmy Westlake of Stagecoach, Colorado. He took this picture of the red planet on Feb. 27th. A brief time lapse video from the last couple of nights during the planetary conjunction of Venus and Jupiter with the moon. I shot these images below an abandoned ski lift in the hills of Northeast Nebraska. All images were taken using a Canon Rebel T1i with a Sigma 8-16mm at f/4.5 at 1600 iso. I had to brighten the sequences some while processing the video so that you could see the foreground a little better, which led to blowing out the moon in these scenes. See 5 Bright Planets in Night Sky—First Time in 8 Years Find out when and where to see naked-eye objects this week. Update: MARS AT OPPOSITION: Mars is approaching opposition. On March 3-5, the Red Planet will be up all night long, opposite the sun and as close to Earth as it will get in 2012. Mars shines overhead at midnight 6 times brighter than a 1st magnitud e star and looks great through a backyard telescope. "I was photographing the alignment when high thin clouds rolled in," says Cordiale. "They threatened to ruin the view, but then this halo encircled Jupiter, Venus and the Moon, framing them perfectly." Update: LOOK WEST AT SUNSET: Venus, Jupiter and the crescent Moon are beaming through the evening twilight, forming a bright triangle visible through city lights and even thin clouds. Try to catch them before the sky fades completely black. The tri o surrounded by twilight blue is an especially beautiful sight. Sky maps: Feb. 25 , Feb. 26. The Moon is shining beside Venus, while Jupiter hovers above. "It was a beautiful conjunction," says Abraham. If you miss the arrangement on Saturday night, try Sunday. The triangle will appear again, just as bright but with vertices shifted: sky map. If possible, look before the sunset sky fades completely black. Venus, Jupiter and the Moon surrounded by twilight blue is an especially beautiful sight. From upper left to lower right, the lights are Jupiter, Venus, and the Moon--all three bright enough to beam through wispy clouds. Watch live celestial events like lunar eclipses, 2012 Total Solar Eclipse, 2012 Transit of Venus and others via SLOOH Space Camera.